Scientific molding practices are essential to achieving outcomes that deliver faster cycles, higher volumes, and a more efficient injection molding process. Implementing sound scientific principles can help with determining optimal molding conditions. Equipment and software that help monitor real-time production processes guide the scientific molding stages and provide a critical advantage. In addition, quality control issues can be avoided by having automated containment control and traceability for specific applications. From collecting data to machine maintenance, process development to resin characteristics, and much more – scientific molding helps identify efficiencies which result in greater value and better parts for customers. How does scientific molding benefit product manufacturers and OEMs? When implemented methodically by an injection molder, scientific molding results in better parts and fewer rejects. Scientific molding involves using data to develop a process that produces repeatable results with little to no variation. Through resin expertise and testing, dimensional or mechanical characteristics of a molded part can be optimized. Often achieved through the use of SOLIDWORKS® Plastics Premium software (mold flow simulation) and RJG eDart® process control systems, predictive insight, process validation and complete process documentation are vital to producing demanding parts. According to Kip Doyle, author of an article on the Top 10 Reasons Why Molders Fail at Scientific Molding, many molders can’t get past a “machine-focused” approach and mold from the plastic’s “point of view.” He cites that many articles have been written on the four primary plastic variables (plastic temperature, plastic flow, plastic pressure, and plastic cooling rate and time), and a scientific molder must understand this approach and the process optimized from the perspective of the plastic. Plastic variables require understanding the nature of the material to be molded and its preferred molding conditions. When a material’s key characteristics, behavior, and response to processing is understood, scientific molders can optimize the molding process to produce the most consistent part possible. Design engineers should lean on past learnings and expertise in optimizing part design for unique applications. Scientific molding elements associated with part design may incorporate using the latest software and technology including computer aided engineering, mold flow, and prototype development that will validate the part’s end use. Radius, draft angle, sink marks, wall thickness, etc. Injection molders should understand how to avoid designing a part, building the tooling, and beginning the molding process only to find out that the design does not work in production. Scientific molding can help manufacturers steer clear of this situation. Scientific molding practices can also be used to optimize tool design or to optimize poorly designed tools. It is essential for injection molds to be evaluated for their performance in the production of consistent, defect-free parts. Engineers should examine every aspect of a mold’s mechanical functionality, using the appropriate material settings. Testing can then be applied to check for any imbalances among cavities. When this analyzation is complete, a gate seal study can be performed to gather data on where the gates seal fully, and at what points in the mold cavities. Recording findings and making recommendations for adjustments in the process or tooling, is essential to correcting potential defects. Recorded data can be used to assess quality control and make any necessary tweaks to tooling - improving overall part quality. Once all quality parameters have been met, the implementation of scientific injection molding practices help to greatly streamline the production process. These actions can be so effective that less involvement is needed by both machines and operators. 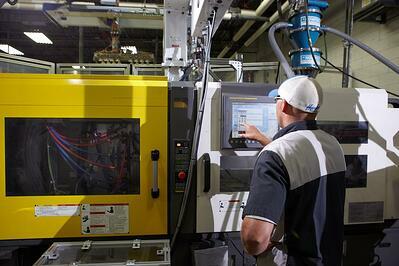 In fact, cutting-edge injection molders have begun instituting revolutionary lights-out manufacturing practices. This is where factories and production facilities are equipped with innovative and automated machinery to conduct tasks that would normally need the presence of a human. As it continues to evolve, scientific molding has helped optimize injection molding production processes in a way that now allows manufacturers to lean on technology that creates an even greater global competitive advantage. Are you interested in learning more about scientific molding and how it can benefit your custom part? Learn how Plastic Components, Inc. will strive to be your best supplier and a team you can count on.